Movie Viewing Guide – Show any movie while students practice meaningful skills! These eye-catching movie response pages allow you to comfortably show a movie knowing students are analyzing topics such as setting, characterization, tone, mood, conflict, and theme. Three additional post-viewing activities are included for learning extension and differentiation. 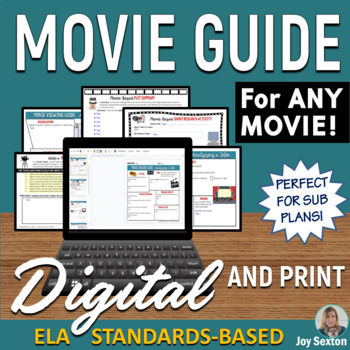 This movie guide resource is perfect for end of year, if you are between units, nearing a holiday break, or in need of a quick and easy sub plan that students will love! I specifically created this resource for your convenient use with movies you have not taught as text. 1. MOVIE VIEWING GUIDE – This vibrantly-attractive 2-page handout (to be copied back-to-back) contains a variety of Common Core-aligned prompts where students analyze topics based on setting, characters, plot events, tone, mood, and theme. The guide is divided into three parts so the film can be paused as students write their responses. If you are looking for quality response work to engage your students while viewing ANY movie, you will appreciate having this convenient resource on hand.